Chris Pizarro looks down from a vantage point, high above, and surveys the sprawling expanse of lights, buildings, and streets. The view is exhilirating from up there, and he paints what he sees. Pizarro’s abstract is an exercise in careful and deliberate restraint. And the discipline comes in knowing when to stop. His urban greeneries are inspired by aerial drone shots, like a survey of the lay of the land. 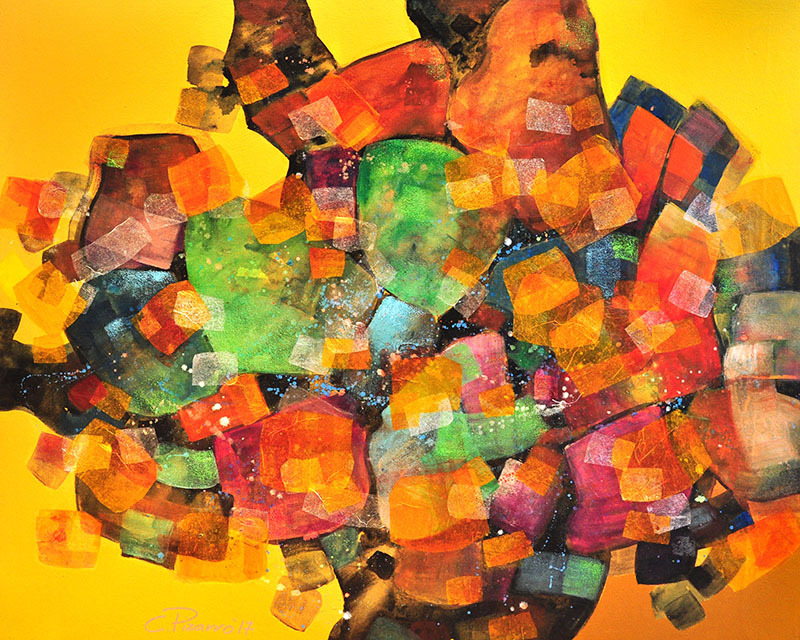 This he assembles via an array of mixed media, from Japanese paper to add embellishments and texture, water-based acrylic, among other things. Drawing from his many idols and from all the techniques he is able to hone and master, Pizarro’s breathaking urban panorama bears the mark of his skill and expertise and his latest undertaking into realizing his full artistic potential. Raymar Conmigo looks at the scattered leaves beneath his feet, and sees the intricacies of their veins, the lifeblood in their foliage, and infinite layer of colors and details. And from a single leaf, he is able to grow a forest. And his signature style is also one of accidental discovery. A sketch of a solitary leaf and in his workshop, leftover materials. It was spontaneous and it grew like wildfire. Spreading from the middle until it bursts outward, Conmigo weaves a fine tapestry of flora and fauna. 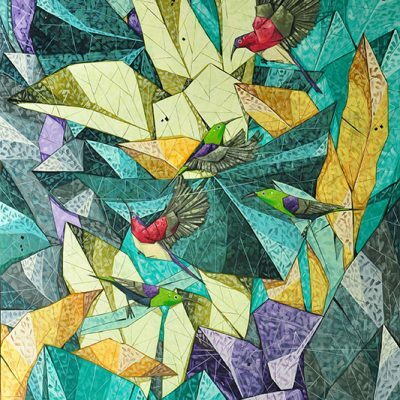 His pieces are not without pops of bird species standing with the leaves – myna, malaguto, maya, and hummingbirds – childhood inspirations from hunting the forests of 1970s Parañaque and Las Piñas. His process is infused with spontaneity, but it will always start at the middle, blooming outward. The under paint is textured with gesso and acrylic, and the outer layers done in oil. Thick black outlines are added as a final step in his process. He then proceeds to add little embellishments, in small swifts streaks of paint to show insects flitting about the foliage. Conmigo’s panorama is an exploration of the sheer majesty of nature, a rare spectacle captured and immortalized in a canvas.